Our national symbol and the first bird on a U.S. stamp, the Bald Eagle is an icon for the success of the Endangered Species Act. Once decimated by DDT, it has recovered and was removed from the endangered list in 2007. In 1963 there were only 400 nesting pairs in the lower 48 states; today there are an estimated 10,000. Alaska has twice that many. In 1782, when Congress chose the Bald Eagle to represent our country, there were an estimated 75,000 nesting Bald Eagles. Benjamin Franklin, in a letter to his daughter, expressed his displeasure, preferring the Wild Turkey instead. Franklin based his opinion on the fact that Bald Eagles often eat carrion and will steal fish from Osprey, “amoral behavior” for a national symbol. Franklin was correct and if you have ever been to Alaska, where there are no vultures, you will see Bald Eagles hanging around garbage dumps and eating roadkill as vultures do here. And to see an eagle stealing from an Osprey, see this U-tube video. The Bald Eagle’s scientific name, Haliaeetus leucocephalus, means “sea eagle with a white head”. The word “bald” did not originally mean hairless but comes from the word “piebald”, meaning patched. (Think of the Pied Piper who wore a coat of patches and see the photo of the Pied Wagtail.) The patches of white on the eagle’s head and tail gave rise to “Bald” Eagle. There is no biological difference between a hawk and an eagle, but those named eagles tend to be bigger birds with wider wings and heavier beaks. The smallest eagle, the Little Eagle of Australasia (pictured), weighs just under two pounds and is the size of a Peregrine Falcon. Bald Eagles are said to mate for life, but there is no solid evidence for that. They certainly form long term pair bonds. Typically 2-3 eggs are laid and the young hatch in 35 days. Three months later they are on their own, but as many as half of the fledglings do not survive their first year. Those that do are mostly brown with some white speckling, resembling a Golden Eagle (which has feathered legs down to the toes and the Bald Eagle does not.) It takes five years to develop the majestic white head and tail. The bald eagle was officially removed from the U.S. federal government’s list of endangered species on July 12, 1995, by the U.S. 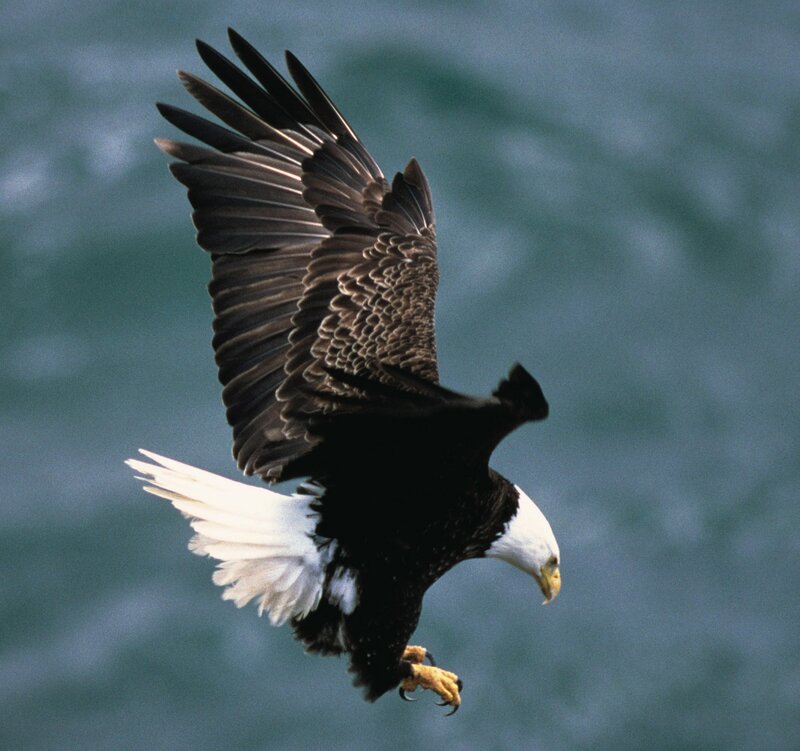 Fish & Wildlife Service, when it was reclassified from “Endangered” to “Threatened.” On July 6, 1999, a proposal was initiated “To Remove the Bald Eagle in the Lower 48 States From the List of Endangered and Threatened Wildlife.” It was de-listed on June 28, 2007. It has also been assigned a risk level of Least Concern category on the IUCN Red List. In the Exxon Valdez Oil Spill of 1989 an estimated 247 were killed in Prince William Sound, though the local population returned to its pre-spill level by 1995. In some areas, the population has increased such that the eagles are a pest. I am trying to get information on what triggers the male bald eagle to develop a brood patch. Is it a hormonal trigger like the female at egg laying time? I have been unable to find this information. Any information, support material you can direct me to would be much appreciated. Here are some references and they each contain many more references.It is a hormonal trigger, initiated by increasing photoperiod. Cain, Steven L. “Time budgets and behavior of nesting Bald Eagles.” Bald Eagles in Alaska. Hancock House Publishers, WA, USA, 436pp (2010). Bryan Jr, A. Lawrence, et al. “Behavior and food habits at a Bald Eagle nest in inland South Carolina.” Southeastern Naturalist 4.3 (2005): 459-468. Fisher, Sheri A., et al. “Brood patches of American kestrels altered by experimental exposure to PCBs.” Journal of Toxicology and Environmental Health, Part A 69.17 (2006): 1603-1612. I am very lucky in that I have a nesting pair of eagles that I can watch from my house. This morning I got the binoculars out to see my two adults on the nest but also what looked like an immature eagle perched next to the nest. Is that common to have a fledgling stay this time of year? Yes, often young Bald Eagles will stay around the nest they were hatched in but also wander a lot. They usually breed in the same area in which they were born.